We’re not huge grapefruit eaters. Heck, in this household, we’re not huge fruit eaters. I am, sorta, but Chris isn’t. So whenever I get fruits from Kimi or Nelson, I tried to eat them, but grapefruit is just not on the list of the fruits I eat. However, I’ll eat fruit in a cake form if there’s crumb toppings involved. Wouldn’t anyone? 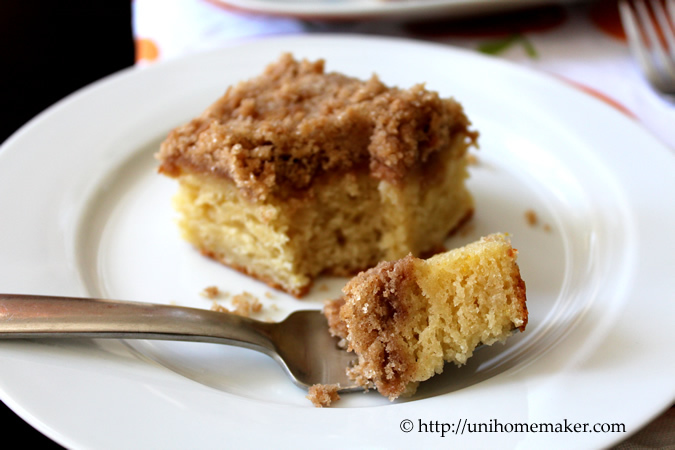 😀 I really love the flavors in this crumb cake. Grapefruit and ricotta, it’s just so yummy that you can’t pass this up. Now march your hineys into the kitchen and bake this. You’ll be glad you did. Preheat the oven to 375 degrees F. Grease a 9-inch square baking pan. Using a stand or electric mixer cream butter and sugar until fluffy. Then add egg, grapefruit zest and continue to beat until combined, scraping down the sides of the bowl. Add vanilla extract, grapefruit juice and ricotta cheese. Mix until well blended. Add flour, baking powder, baking soda and salt. Mix until just moistened. Pour batter into the prepared pan. Make the topping: In a medium bowl combine sugar, flour, ground cinnamon and butter. Use your fingers to mix until you have a crumbly mixture. Sprinkle topping evenly over the batter. Bake for 27-30 minutes or until toothpick/tester inserted into the center comes out clean. 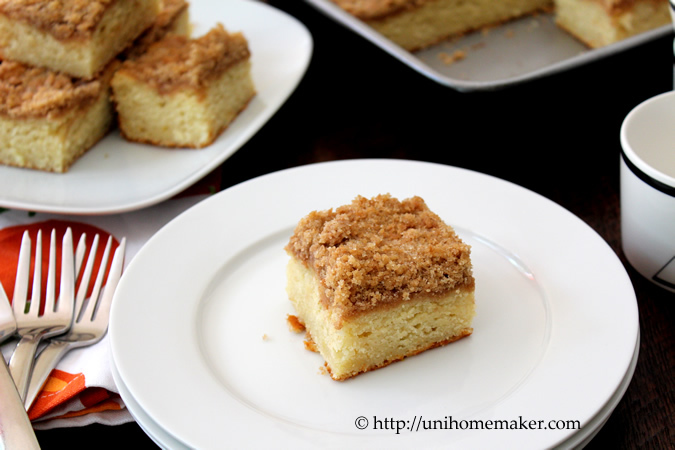 Let the crumb cake cool completely before cutting into the pan. Sounds great! I love the combination of Ricotta and Grapefruit. Sounds yum! I make an orange cake with orange zest and the juice. Never tried with grape fruit though. I’ve been eating grapefruit almost everyday lately…my old self would never recognize my new fruit- and veggie-loving self! : ) What an interesting idea to pair it with ricotta. It looks moist and delightful and, of course, I can’t take my eyes off that crumble top! What a great idea and a perfect way to use up the grapefruit I have sitting in my fruit bowl. mmmm..the streusel topping is just irresistible! I am a huge grapefruit fan, and I eat it bruleed or with no sugar at all. I would never have thought to pair it with ricotta! Sounds very intriguing. I try so hard to like fruit, but not so much over here either! Of course, anytime it is in cake form I’ll eat it. The grapefruit flavoring is definitely intriguing me, I’ll have to try this soon. 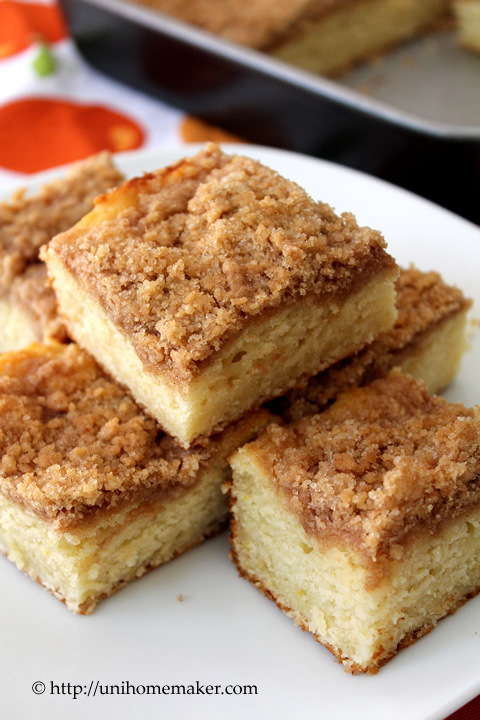 These cake squares look so delicious. I love ricotta and it always gets my attention. This looks moist and delicious. I love grapefruit; I’ll be making this soon. 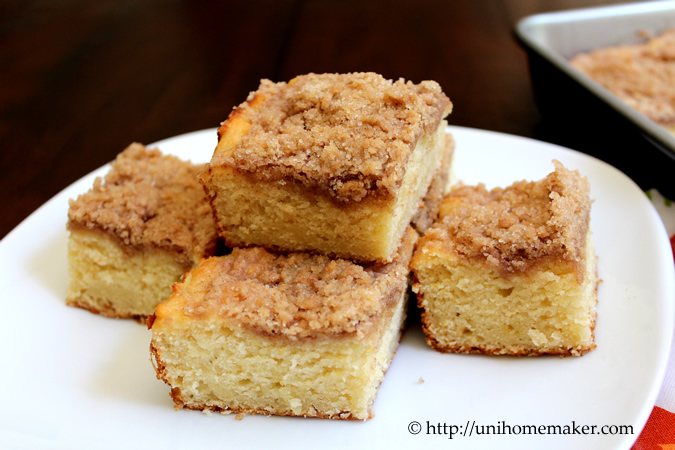 I love crumb cake, such a favorite. I never thought of adding grapefruit, great addition for the summer! What a delicious cake. Yes, I think any one would be anything with a crumb topping! 😛 I know I would for sure. I’ve just bought a grapefruit for the first time in months to use within a savoury dish for tomorrow. Wow, in cake I’m very into the idea. Especially using the zest. Although, I think you’ve told me white grapefruit is milder in flavour. I love crumb cake, Anne, and one with grapefruit flavoring would be a real treat. Thanks for sharing your recipe. I am a fruit eater, and a vegetable one too. But citrus can be just a flavor, all fat, starch and calories with no resemblance to fruit, jaja .This might be the perfect recipe for some ricotta I have left from the berry bars I made yesterday. It looks sensational! I love fruit! does this have that slight grapefruit bitterness? I am a loner in a family of grapefruit-dislikers, and I wonder if this would be something they’d eat.. I used white grapefruit in this recipe and did not encounter the bitterness. When you zest the grapefruit, be sure not to take the pith part as that can be bitter. Good luck! I have never baked with grapefruit and it sounds like a brilliant idea! Love the ricotta-grapefruit combination, looks very refreshing. what a unique recipe.. barely ever see recipes with grapefruit. looks fantastic. The cake looks incredibly fluffy! Wow! I usually veer far, far away from grapefruit, but I bet that the ricotta would effectively balance out all of the tartness in the fruit. Sounds intriguing! I love the smell of grapefruit, but then again I love all citrus fruits. This would be a big hit at my house, great recipe Anne! I love grapefruit, the rest of my family doesn’t – but maybe with a cake, I could get them to eat it… Sound really delicious, and any cake with fruit in has to be a little bit healthy too, doesn’t it? Very original combination, I saved the recipe. I use oranges, lemons and other citrus fruits in cooking and baking but never thought of using grapefruit, thanks for the idea. Thanks for stopping by Norma! Mmm looks good. i love fruit but I also don’t eat it nearly enough! I bet this tastes awesome. Thank you so much Muna! 🙂 Have a great day. I’m so surprised at the blending of ingredients and yet, I bet it worked beautifully. It sure looks it! Thank you so much for popping over! I appreciate the lovely comment. 🙂 Have a great Friday! Looks gorgeous even if I am not a big grapefruit fan. I bet I’d demolish a slice of this though. Grapefruit and ricotta, Oh My! Gotta give this one a try! High five on the not-a-big-fruit-eater! If you see bananas on the counter, it’s becz I’m waiting for them to turn black to bake something sweet with them! I bet the ricotta gives this cake so much moist texture! Love this recipe, Anne! Already pinned! 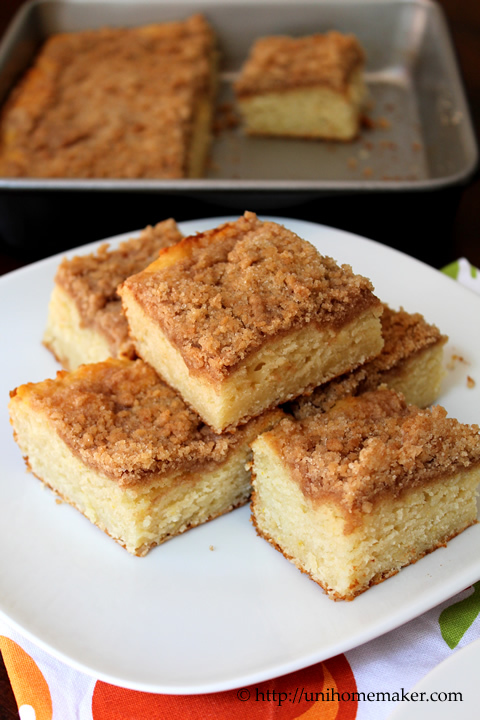 I love grapefruit and crumb cake. This is a recipe I will try. Thank you for sharing. Looks lovely!!! I love the citrusy bite of the grapefruit! I hardly ever see it used in baking. I’d much rather eat it in a dessert then as is! When I see fruit I think what can I bake with that? Haha, I’m the same way too! 😉 Thanks for stopping by Reeni.